Facebook keeps user counts for its mobile apps hidden, but analyst Benedict Evans found a way to uncover them and they provide critical insight into the direction and performance of Facebook’s mobile efforts. Most interestingly, Facebook’s Android user count is growing much faster than its iPhone user base, but is found on a lower percentage of Android devices. Let’s take a closer look at the data. A year ago, Facebook stopped reporting user counts for its own mobile apps via the Graph API. But if you searched for one that none of your friends used and hovered over the search result, you could see its monthly active user count (MAU). Evans of Enders Analysis meticulously recorded until “some time in November , those disappeared and were replaced” with hover cards lacking the usage data, he tells me. He incorrectly calculated Facebook’s mobile web site stats due to overlap between native app and HTML5 site users. Facebook declined to comment but solid analytics sources and old official numbers say the rest of his stats are accurate. Evans gave me the raw data dump from his research, which is more current than his blog post, and here’s what it shows. As of September 2011, Facebook for Android has 66 million MAU and Facebook for iPhone had 91 million MAU. In December 2011, right before Facebook stopped openly publishing stats, Android surpassed the iOS app. By just 11 months later in November 2012, Android had grown to 192.8 million MAU while iPhone only had 147.2 million MAU. This shows Android is a core source of growth that helped Facebook reach 604 million mobile users by the end of Q3 2012. This underscores the need for Facebook to speed up Android development. Many new features and sometimes entirely new apps like Pages Manager launch first on iPhone. This could be because Facebook defaulted to giving employees iPhones for a long time, and still more team members carry them than Androids. While Facebook for Android may have more absolute users than its iPhone counterpart, the iPhone has a much better penetration rate. Facebook’s native app is actively used by 73.6 percent of the estimated 200 million iPhone install base. Only 35 percent of the estimated 550 million Android install base see monthly usage of Facebook’s native app. This may be in part due to the popularity of Android in China where Facebook is blocked. However, it may also show Facebook’s lagging penetration in emerging markets like India where Androids are common. This all leaves out the iPad, though. Facebook for iPad rapidly grew from just a few million users in September 2011 to 48 million MAU in September 2012. If you estimate iPad’s install base at 100 million, 48 percent use the Facebook app monthly. That’s a lower penetration than on iPhone but worthy of regular updates. Meanwhile, out of the 195.2 million iOS devices regularly accessing Facebook’s native apps, only 53.8 million or 27.5 percent of devices have turned on Facebook’s iOS 6 integration. That means there’s lot of people who aren’t using contact sync, easy sharing, and single sign-on for third-party apps. Facebook may need to come up with a way to convince more users to turn on the integration, both for its own benefit, and to convince Apple that Facebook is a powerful partner. The big takeaway from the iOS / Android platform battle is that Facebook needs to focus more on Android. If Facebook’s iOS and Android apps have continued on the same growth trajectories, by now Android likely has more MAU than the iPhone and iPad apps combined. Even if Android is not the preferred mobile OS of employees, building for it is critical to keeping its overall mobile usage growing. From September 2011 to November 2012, the Facebook’s feature phone app called Facebook For Every Phone that’s built on the Java Platform, Micro Edition, more than doubled in MAU to 82 million. The feature phone app’s growth shows emerging markets around the world are getting on mobile, and a decent number are using Facebook. We don’t hear much about this app from Facebook. That might be because most of its employees carry smartphones, and so it may be harder to see how important it is, brainstorm improvements, and test updates. But until low-cost smartphones start displacing feature phones in the developing world, Facebook needs to innovate here. What it doesn’t need to worry as much about are the second-tier smartphone platforms. RIM’s BlackBerry still has a somewhat significant Facebook user base of 60.2 million as of December 2012. Unfortunately that was only up from 48.9 million in November 2011, and its failed PlayBook tablet’s Facebook app had just 690,000 MAU by December 2012. Meanwhile Nokia had 15.7 million MAU by November 2012, and Windows Phone had only a couple million Facebook users. Fracturing engineering resources across these platforms is likely inefficient for Facebook. Facebook does a lot. Having a ton of features on the web makes sense, but cramming them all in a single mobile app can make it feel bloated. That’s why Facebook began releasing standalone apps in August 2011. They give users quick access and a dedicated interface to a popular feature, and helps Facebook experiment with new capabilities it might add to its primary smartphone apps. After buying the group messaging and SMS-replacement app Beluga in March 2011, Facebook re-skinned it, and hooked it into its unified web/mobile messaging system. The result was Facebook Messenger which launched for iOS and Android in August 2011. A month later it had almost 3 million MAU. Growth picked up in the fall and it had 10 million users on each platform by November. It continued steadily gaining users, and Android pulled in front of iOS in Fall 2012. By late November 2012, Messenger had 22.8 million iOS MAU, 32.3 million Android MAU, and 1.6 million BlackBerry MAU for a combined 56.7 million MAU. That sounds impressive but Messenger still lags far behind several international messaging apps. WhatsApp is believed to have several hundred million users and China’s TenCent says its WeChat app had 200 million users as of September 2012. That’s why we’ve heard Facebook has made inquiries about acquiring WhatsApp as well as Snapchat, which it instead ended up cloning as Poke. Owning the platform you private message on is critical to Facebook because knowing who you message with helps it refine its content-sorting relevancy algorithms. There’s also potential monetization options within messaging. Facebook knew it had do something unique with photos on mobile. So, long before it began negotiations to buy Instagram, it started building Facebook Camera. The Instagram deal was signed quickly, and Camera was almost done so it launched the standalone app a month later in May 2012. Though Camera offered its own filters, a powerful bulk upload option, and more cropping flexibility, Instagram had too much momentum and a loyal user base. Instagram passed 100 million users in September 2012. Thanks to Evans, we’re now getting our first look at Camera’s progress, and its lackluster performance. A month after its launch it hit 1.4 million users, dipped for a while, and now six months later it only has 1.5 million MAU. That doesn’t mean it’s not valuable to Facebook. It showed a slick photo selection flow, filters, and bulk uploads were popular, so Facebook added them to its primary apps. But in the end, Facebook may be better off dedicating development resources to Instagram. 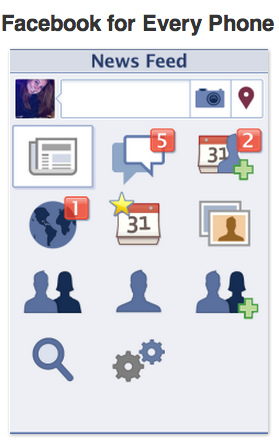 What’s Next For Facebook Mobile? To put it simply — going hard at Android, making its feature phone app more viral, and figuring out whether to concentrate on one omni-app or several standalone apps. Obviously there’s monetization, but that’s for another article. Android’s growth momentum means Facebook for Android needs to become its premier app. Facebook’s competition with Google might make that painful, but it needs to stick to its social layer strategy. It should view building an incredible Android app as a way to take advantage of Google’s mobile install base, not the other way around. There’s a ton of of feature phone users, and not enough are on Facebook. The social network should look to how it can convince its feature phone users to get their friends on-board too. That might mean some kind of incentive program for feature phone recruiters or recruits, such as mobile data discounts. Finally, with Messenger, Camera, Poke, and Pages Manager, its standalone app portfolio is starting to bulge. Users might not want a home screen full of Facebook, and that might lead them to bury the apps in a folder. Then again, Google has done well with a suite of standalone mobile apps. Either way, 2012 was about Facebook getting serious about mobile in general. 2013 will be about trading the shotgun for the scalpel.